As an outside linebacker for a professional football team in Washington DC, Ryan Kerrigan, Franklin and George’s dad, depends on the right food to fuel his body for every play on the field – and his best friends depend on the right food to fuel them for play off the field. Franklin is an eight-year-old bulldog who took care of his little brother George, three-years, who suffered from heart issues and couldn’t be as rough and tumble as his big brother. Getting premium nutrition is just as important to Franklin as it is to Ryan – all pets, active and not-so-active, need quality high meat protein pet food to thrive. After all, they are carnivores. Ryan’s wife, Jessica, is a vet tech and the two of them together work with the Humane Rescue Alliance and even set up a charity organization to help pets in need in their area. 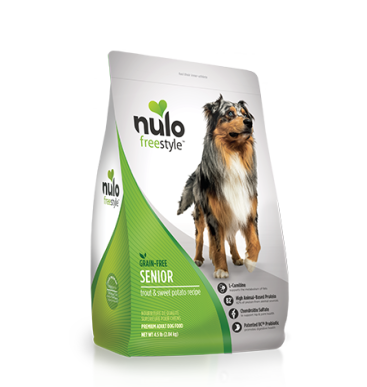 Nulo is so pleased to be able to team up with the Kerrigan’s to help educate consumers that nutrition is the most important decision you can make for your pets! Ryan and Jessica lost their sweet George in November 2018. George will be dearly missed, but he will always be a part of our Nulo family and we are honored to have had the chance to know him. Nulo will make all Sacks For Shelter Pets donations in George’s memory so that his legacy lives on and his spirit continues to impact others’ lives the way he did when he was here with us. Starting with the 2018/19 football season, Ryan and Nulo decided to establish the Sacks for Shelter Pets program where Nulo will donate 1000 meals for each sack that Ryan gets during the regular season. These meals will be donated to a shelter of Ryan and Jessica’s choosing at the conclusion of the season. The mission is to help as many pets waiting for their forever home get the best nutrition possible. Getting these cats and dogs on a premimum nutritious diet is a great way to ensure they look and feel their best as they try to get adopted. TOGETHER, Nulo will be donating 13,000 meals in 2019. Ryan takes care of George with FreeStyle Senior Trout & Sweet Potato kibble. Which food is right for your pet? Nulo recipes fuel long-lasting energy.